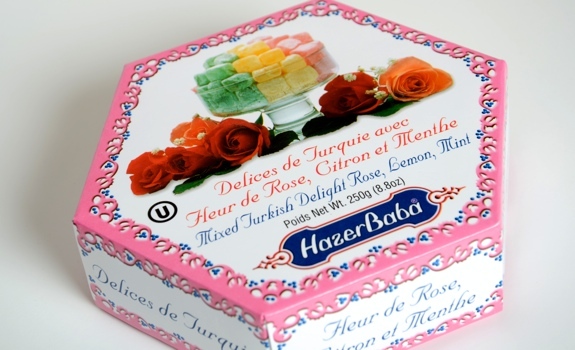 A box of Hazer Baba Turkish Delight. I feel silly saying this, but the I think the first time I tried real, honest-to-goodness Turkish delight (a.k.a. lokum) was around five years ago, at Edmonton’s Heritage Festival. I bought a small baggie full of jellied Turkish delight cubes at a pavilion that, I think, belonged to one of the “-stans.” I had no idea what to expect. After popping a rose-flavoured block in my mouth, I couldn’t believe it. For years, I’d woefully misjudged Turkish delight. See, in these parts, most people’s exposure to Turkish delight begins and ends with Big Turk, a yucky, over-sweet chocolate bar that doesn’t do anything for me. I’ve tried Big Turk repeatedly over the years, hoping I would eventually appreciate why such a mediocre confection hadn’t been consigned to the dustbin of history decades ago. To this day, I still don’t care for Big Turk, and I’m starting to think I never will. But please know this: Big Turk and Turkish delight are two VERY different things. 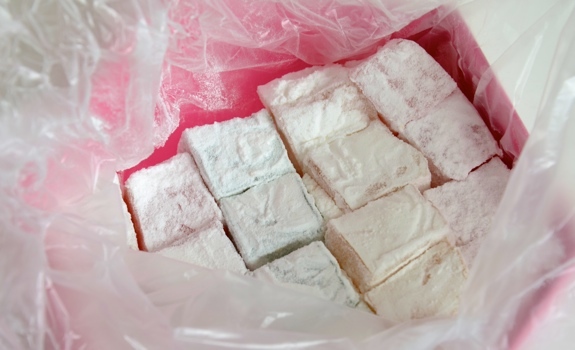 If you think you don’t like Turkish delight because you once took a bite of a Big Turk, do yourself a favour and try the real stuff. In this case, the real stuff is made in Turkey by Hazer Baba, and sold in pretty little hexagonal cardboard boxes. A slightly murky clear plastic bag holds the powder-coated cubes of Turkish delight. The Look: Pretty, colourful cardboard box, wrapped in film plastic. By looks alone, it’s positioning itself on the premium end of the Turkish delight spectrum. 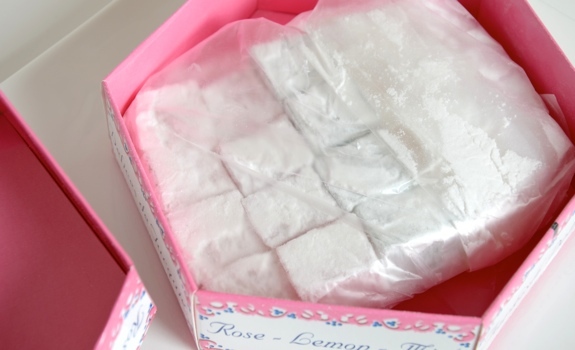 Inside, there’s a plastic bag lining that holds the icing-sugar-powdered cubes of Turkish delight. Each cube is a bit less than one cubic inch in size. Hidden under their powder coat, they’re nothing to look at, but cut them in half and they reveal a vividly colourful inside. Open the bag inside the box and ... Turkish delight! The red one (rose): Soft, sweet and delicately floral. It’s like eating a sweet rose-petal perfume. Outstanding. This is what Turkish delight is all about. The yellow one (lemon): Nicely lemony, without any sourness. More juicy than zesty, with loads of fresh citrus sweetness. You couldn’t eat many of these at one sitting. The green one (mint): My least favourite of the three, but still fantastic. The mint starts slowly, then builds to a mouth-filling coolness that lingers for minutes. Again, the sweetness is intense, and the texture is bliss. 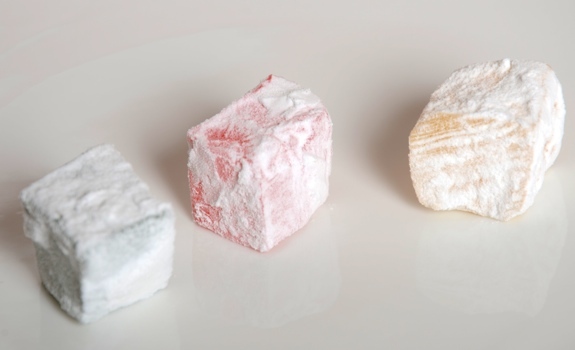 Split in half, the colours inside each cube of Hazer Baba Turkish Delight are vivid. Cost: $5.99 for a 250 gram (8.8 oz) box at Kalamata grocery in Calgary. Value for cash money: Not great. For $6, you’re only getting 20 chunks of the stuff. You can find more plain, ho-hum Turkish delight for less, but this is the good stuff, and the good stuff costs more. Availability: In Calgary, Kalamata stocks a wide range of Turkish delight. In Edmonton, I’m pretty sure I spotted a box of the same brand at Hellas Foods, just off 124th Street. That was a few years ago, though. Nutrition? : Per 2 pieces (32 grams): 130 calories, 0.3 grams of fat, 0 mg of sodium, 1 gram of fibre, 1 gram of protein. Warning: Be careful about not getting the icing-sugar coating all over yourself. Expect sticky fingers and powder-speckled shirts. The verdict: A splendid little box of Turkish delight. 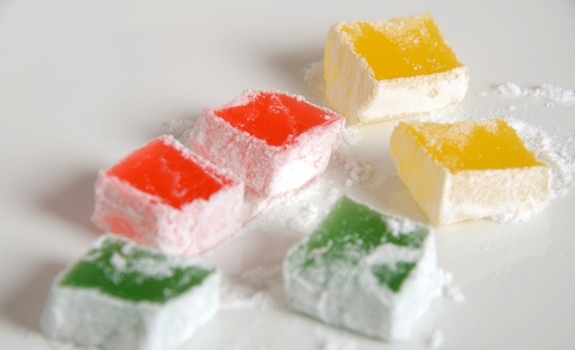 If your only experience with Turkish delight is Big Turk, seek out the real thing and taste the difference. I love “real” Turkish delight! We sought it out in Victoria a number of years ago when we were reading The Lion the Witch and the Wardrobe to our kids. We found it in a little confectionary shop in Market Square whose name escapes me. Whatever you do don’t underestimate the power of Turkish delight. In Narnia Edmund meets the White Witch, who plies him with Turkish Delight and he is so tempted by the seemingly unending supply of it and he betrays his siblings! I’m surprised the CIA hasn’t adopted it as their main choice of interrogation tools. I agree that The Big Turk bar is a weak facsimile of the real deal but I don’t mind it. if you use a lot of it, now is the time to get a bargain. Oh no! Does downsizing mean they’re moving to a new, smaller location? It would be sad to see them gone from the Edmonton food scene entirely.